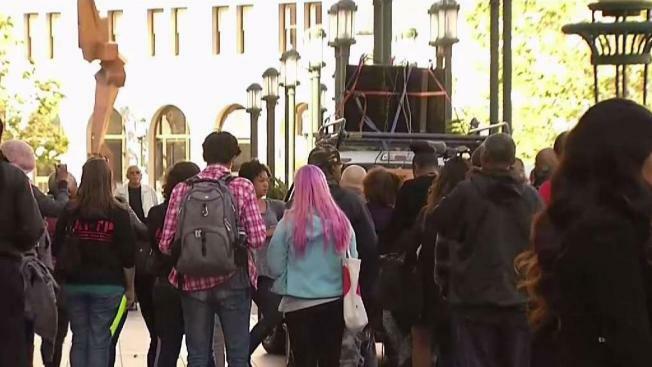 Protesters gathered outside City Hall Thursday to grill Oakland City Council over what they say is the over-policing of African-Americans in the East Bay. Melissa Colorado reports. Protesters gathered outside City Hall Thursday to grill Oakland City Council over what they say is the over-policing of African-Americans in the East Bay. This comes two weeks after the video of a woman being confronted for calling 911 to report an African-American family barbecuing at Oakland’s Lake Merrit went viral. The woman, who has not been identified, says she called the police to report an African-American man who was using a charcoal grill in an area where they are not allowed. "They enacted rules for a reason and they should be followed," she said in the video. Ultimately, police arrive and the woman told the officer she was being harassed. Protestors said people who use 911 as a tool to discriminate, need to be held accountable. Demonstrators said the barbeque outside of City Hall held a symbolic message not just for Oakland, but for the county. Oakland Councilmember At-Large, Rebecca Kaplan, issued a statement regarding the Lake Merritt issue Thursday night. "The recent event that took place at the Lake doesn’t embody the Oakland that we need to protect," she wrote. "The Oakland WE strive for is inviting, loving, respectful and accepting." She added, "This issue has a long and troubling history, and is interconnected with other forms of prejudice and disrespect towards Black people. It is important to ensure that we provide a community that is welcoming to all people, and that we build a shared understanding that allows for the respectful use of our shared public spaces." Kaplan also gave two suggestions to Oakland residents, one on the public policy side where she encouraged the city government to "clarify and simplify" requirements including reasonable space for barbecue activities with fewer restrictions. Also, for the city to expand the use of civilian staff to handle concerns that don't involve public safety.